Our plating solutions Gold Strike and Gold Strike Xtra allow you to gold plate straight on to chrome without having to first strip it off. It also deposits a very adhesive layer, which means you can subsequently plate thick layers of gold using our Gold Brush Plating Solution or our Gold Tank Plating Solution. Gold Strike and Gold Strike Xtra are also good for plating on to harder to plate stainless steel alloys, which includes items such as yacht fittings, dental fixtures and kitchen implements. The 'Xtra' refers to an extra 2 grams of gold which means Gold Strike Xtra plates at the same rate but has more than twice the coverage of Gold Strike. The demonstration below uses Gold Strike but all of the instructions will be the same for Gold Strike Xtra. Below is a short project which demonstrates gold plating a chrome plated lighter. To prepare the surface of the Chrome, polish with our MPU and a soft tissue. Once cleaned, rinse with water. Set your Power Plating Rectifier to between 3 to 4 volts and fit a Carbon Electrode to your Electrode Handle. If you are using one of our MF Rectifiers, please click HERE for instructions for setting it up for brush plating. 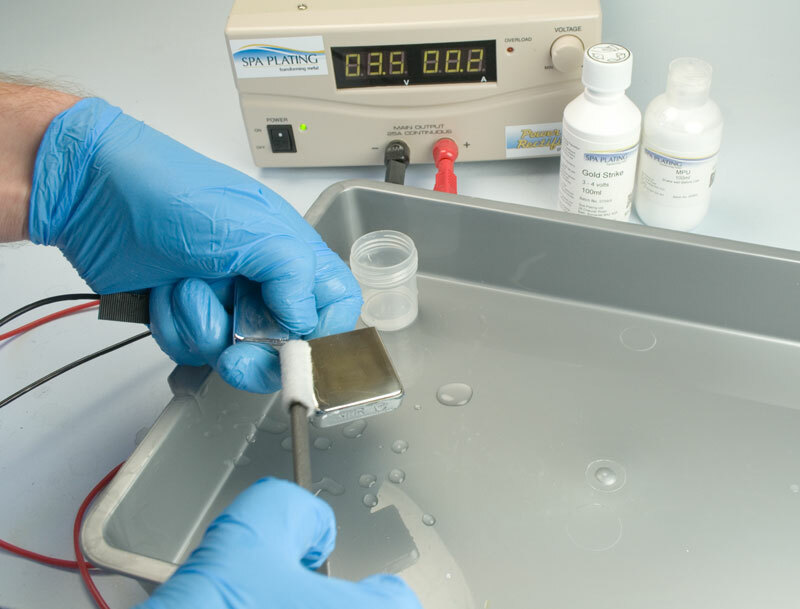 Slip on one of our S-Type Mini Swabs on to the electrode. 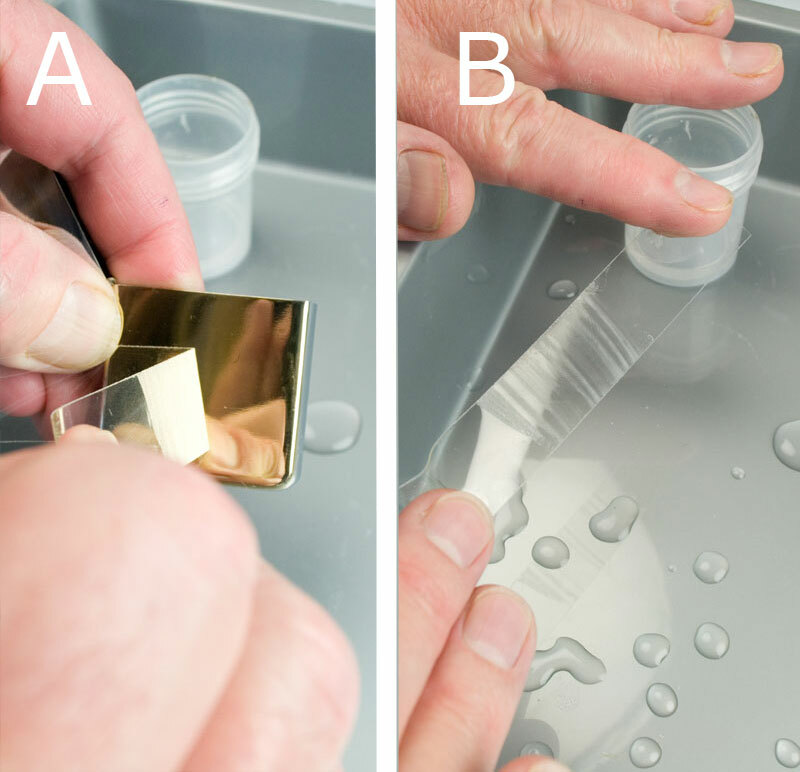 Dip the pre-wetted swab into a small amount of the Gold Strike and start plating with regular circular strokes. You will quickly see the gold being deposited on to the surface of the chrome. Once you have covered the surface of your work so that the underlying metal completely disappears, you have built up a suitably thick key layer for subsequent plating with our other gold solutions. We recommend plating to a thickness of about 0.1 microns with our Gold Strike to create a key layer. The sellotape test demonstrates just how adherent a layer Gold Strike deposits. The selloptape was firmly stuck the the Gold Strike surface and then firmly and quickly removed. All the gold stayed plated to the surface of the work and there wasn’t a trace of gold left on the sellotape. Is Gold Strike and Gold Strike Xtra available for me in the US? Gold Strike and Gold Strike Xtra are not available in the US as they contains battery acid and cannot be shipped. The export version of the solutions are available however and can be bought in the US, but you need to add the battery acid there.